Little Owl has big feelings when Mommy says there will soon be a new baby owl in their family. 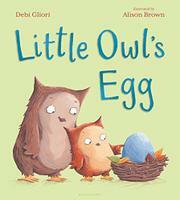 Mommy wisely accommodates Little Owl’s protestations about the egg she’s laid and initiates a playful conversation about what could be in the egg besides a “new baby owl.” It could be a baby worm, or maybe chocolate, or a penguin, or even a crocodile. Little Owl objects to each idea in turn but also adds a few ideas (elephant, dragon) that Mommy rejects. The culminating idea of a “baby Princess Wormy Choco-Penguin Crocophant Dragowl” provokes laughter and ultimately prompts Little Owl to speculate that “a little owl just like me would be much more fun.” Patient, supportive Mommy agrees: “Yes….We’d love a baby owl much more than a baby anything else.” Comforted and secure, Little Owl and Mommy end the story with a scene of cozy, contented anticipation. Brown’s acrylic-and–colored-pencil illustrations do little to expand upon the straightforward text, but their soft, cartoon style matches the playful spirit of the text for this well-worn picture-book theme.